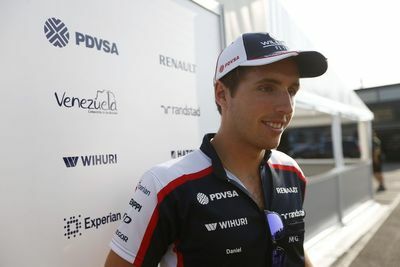 Spanish racer Daniel Juncadella says he is hoping for a role with Williams in the future, following the team's partnership with Mercedes from 2014. Reigning Formula Three Euroseries champion Juncadella is currently racing in DTM this season and is eleventh in the championship. Williams currently has a vacancy for a young driver at the team following the promotion of Valtteri Bottas and deputy team principal Claire Williams admitted that they are keen to fill the slot. Juncadella recently tested for Williams at the young driver test. "Next year, Williams and Mercedes will have the same engines. Mercedes can send its young drivers to a team it is connected with, where they can show their potential," Juncadella told Championat. "There is a good chance that, in a few years, I can be the main driver for Williams. We will see. First I need to show strong results in the DTM." Juncadella says he chose to drive in the DTM, despite holding talks with GP2 teams. "I had a chance to speak to GP2 teams, but I accepted the Mercedes offer. It was a safe choice. DTM also provides a path to F1, as we saw with Paul di Resta." "You work with so many people here, it's a bit like F1! I believe that the DTM is the best way to Formula 1, because there is a lot of politics in GP2 and World Series by Renault."